Virgin Express started its operations from Brussels,Belgium in 1996. It rose from the ashes of EuroBelgium, through an initiative and investment of the Virgin Group (UK). Boeing 737-36N OO-VEX (c/n 28670/2948) at Amsterdam IAP on 25Jan05. 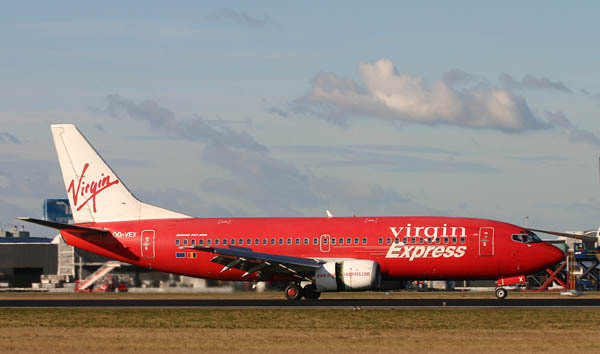 When Virgin started Virgin Blue in Australia (on 31 Aug. 2000), the colourscheme must have inspired Virgin Express in adapting their version; by late 2002 or early 2003 the new colourscheme was introduced on the Belgian 737s. Boeing 737-43Q OO-VEP (c/n 28489/2827) at Amsterdam IAP taking off on runway 36L ( 01Nov04). 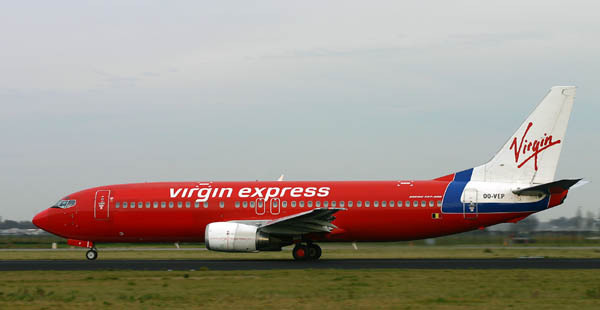 In 2004 the news was published that SN Brussels and Virgin Express would merge to SN Airholding; Virgin Express operated under their own identity for the next 2 years (Virgin has 11 aicraft, SN has 38; the former targeted the low-cost passenger marker, while the latter aimed for the more traditional passenger). In 2007 both airlines merged into the new company: Brussels Airlines.